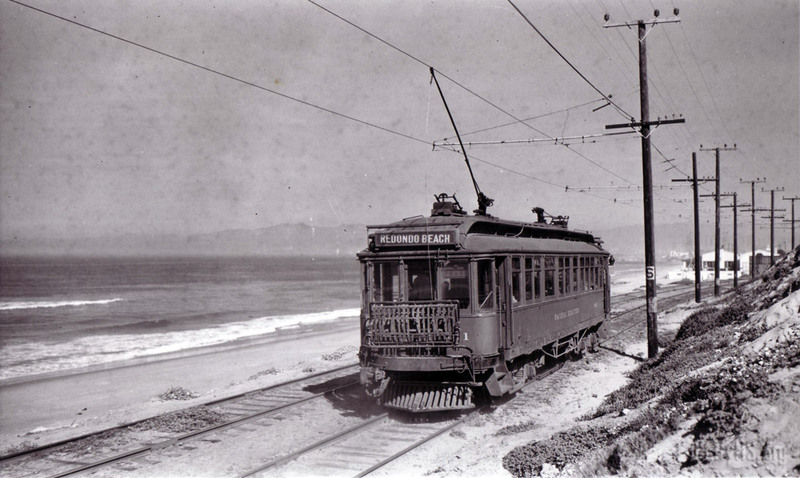 Pacific Electric interurban no. 841 heads north along the surf line after turning at Redondo Beach. Just about to enter Playa Del Rey. Sights like this should make life on the beach exciting. This can’t be headed North as that’s the Santa Monica Mountains in the background not Palos Verdes. This is headed South, looks to be around where the current Marina is located or maybe south of Torrance Blvd where the bluffs have been forever. 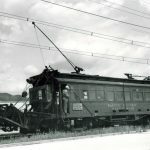 Jack – check out the direction of the trolley pole. – Ed. The #841 is headed back to LA and is North bound probably making a mile-a-minute!! Heading south from Playa del Rey; Westport Beach Club buildings in center right.